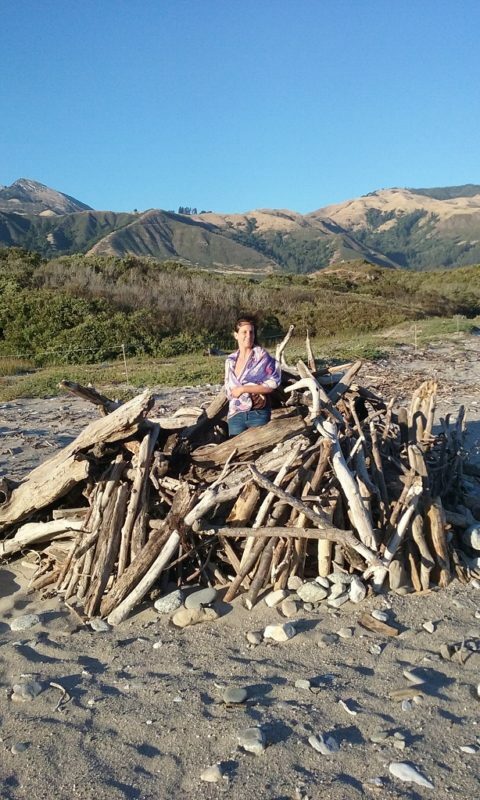 I am sitting in the light of the (almost) full moon, on the (almost) longest day of the year in Andrew Molera State Park, at the northern end of Big Sur. Yesterday, my friend Brendan and I flew to San Jose. 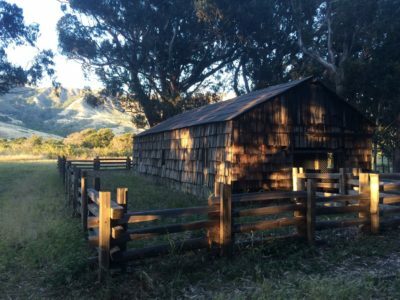 We were eager to get out of the city and into some of California’s most scenic regions. Unfortunately due to a plane delay and getting in later than expected, we opted for sleeping in Santa Cruz, which is just like Eugene but even more so, except it’s on the ocean and the weather is better. I have had the occasion to spend some time in Santa Cruz through the years, but Brendan had not, so we took the opportunity to explore the town a little bit. I woke up and went for a morning walk to greet the ocean. Even by 8:30 am, the beaches were filled with people playing volleyball and the bay had a plethora of kayakers. I smiled when I walked the pier and heard the sea lions howling. I have seen these sweet creatures on the southern tip of Baja all the way up to Anchorage and everywhere in between. Clearly they are not picky about the temperature! The boardwalk is a bit touristy with the amusement park, so we opted for strolling downtown. 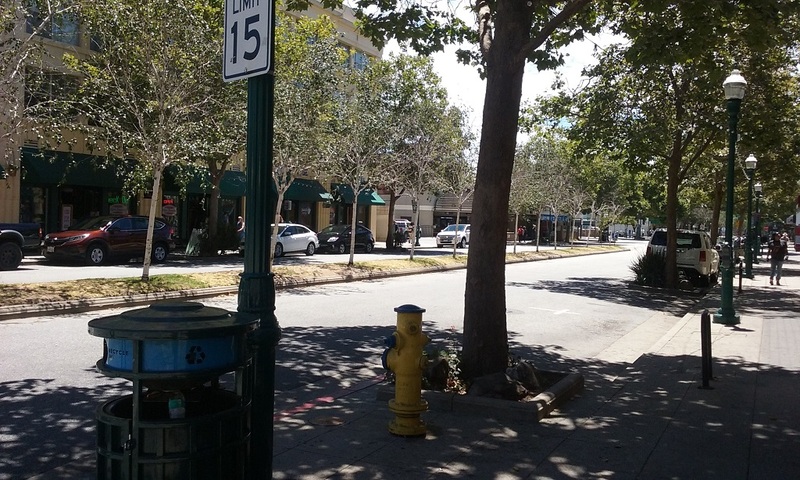 Downtown Santa Cruz is vibrant for a town of its size and it is well built. The former downtown was destroyed in an earthquake in the 80’s, and the new one was created with a lot of input from the citizens. Anyway, it’s super cute and has lots of activity all of the time. The shops are straight out of an episode of Portlandia. Organic clothing stores. Head shops with 3-D tapestries. And at least one yoga studio per block. 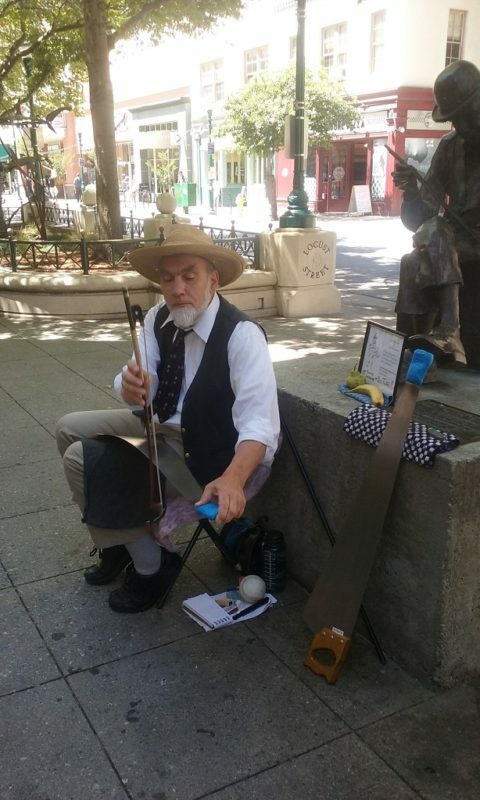 Neither of us are big shoppers (major understatement here), yet we had a good time soaking up the vibes and listening to a man play us a tune with his bow and saw. And Brendan couldn’t resist picking up a pair of unicorn socks (probably made for a girl, but he loves unicorns and was happy to overlook that part). On the practical side, we stopped to get gas for our stoves, as we intended on going gourmet while camping. We wanted to get our camp set up while there was still plenty of light left and avoid too much traffic so we did not tarry too long. Highway 1 runs up and down the west coast of California and the section south of Monterrey Bay is reputed to be one of the most scenic drives in the country. 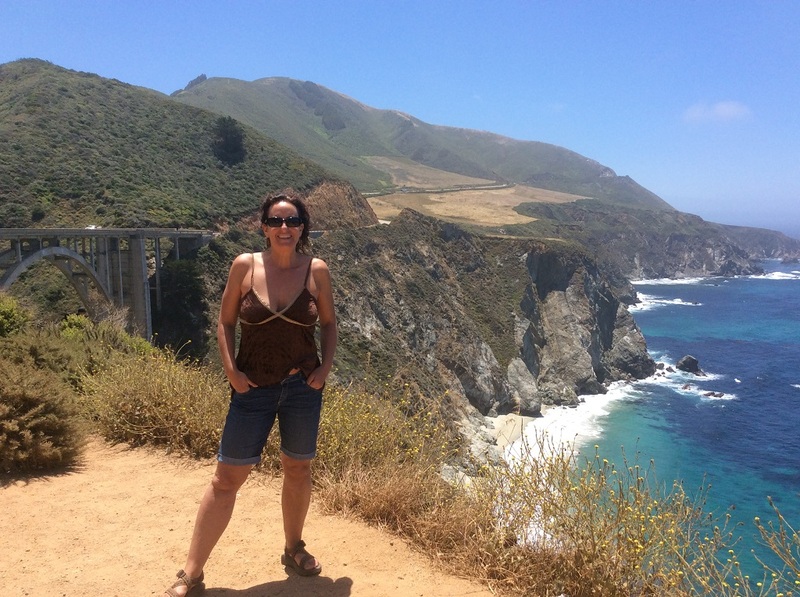 We drove about 60 miles and winded our way through Monterey and Carmel and once we went over the Bixby Bridge, we were officially in Big Sur. The traffic moved slowly and in part it is because the roads are cut into the mountains and twist and turn as you hug the coastline. As a result the scenery is so dramatic that cars are pulling over at every turn out and vista point to capture the beauty that lay before them. We of course did our obligatory photo-op featuring the Bixby Bridge. What drew us to Andrew Molera to camp was the fact that you have to walk your stuff in a quarter of a mile and thus there are no vehicles. It can be a serious bummer to travel so far and then be stuck next to a loud RV (or 20 loud RVs). It no longer feels like vacation, at least to me. They don’t take reservations, so its first come first served. If you want to camp during the weekend, it is best that you arrive during the week. We met a man named Morgan who had a bike cart and he helped us get our well stocked cooler in and we took a couple more trips with the rest of our stuff. The camp ground is in an open meadow with trees around the perimeter and a sparse planting of trees in the meadow itself that provide shade for the tents. We selected a sweet spot under a cottonwood tree, set up camp, and decompressed before strolling the path down to the ocean. The stroll took us through a grove of eucalyptus trees which had a very majestic and surreal feeling to it. The way the wind blew through the tops the grove made its own music, with the backdrop of the blueish and orange hues of the bark – it felt a bit like being in a suspense film. 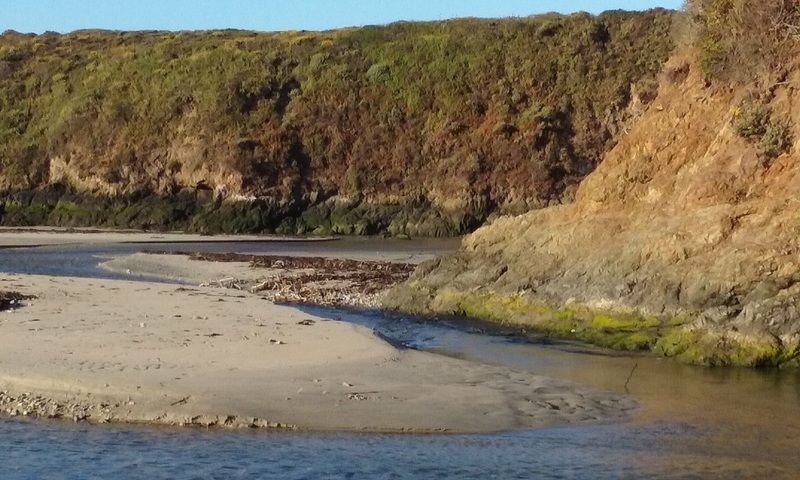 The path at some point ran parallel to the Big Sur River which took a circuitous route and met up with the ocean. We waded through the freshwater to get to the sand and then we sat back to drink in the scenery. 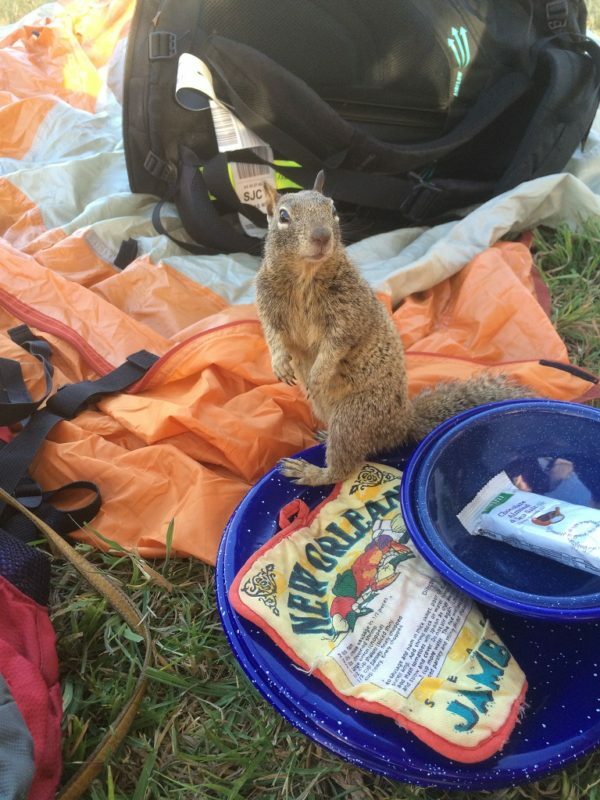 Back at camp, we had made friends with some ground squirrels, which were in abundance for sure. They would stand up on their hind legs, almost like a prairie dogs and scope out who was doing what and, more importantly, who was eating what. At first, I was completely enamored by them and how cute they were. Once they starting getting super bold and crawling up the tent walls (don’t puncture the fabric please! 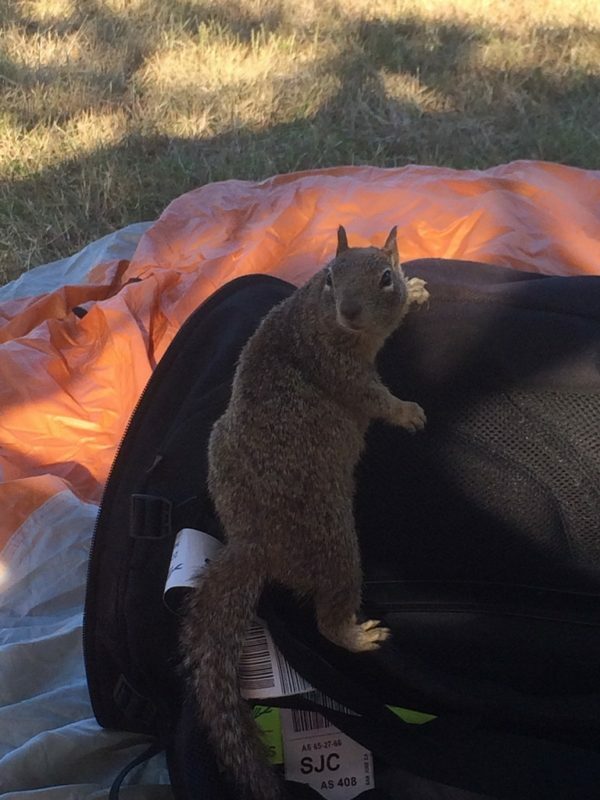 ), coming inside the tent and clawing their way into my backpack (dark chocolate, oh my! ), I was less enamored and realized they are aggressive little opportunistic rodents. They clearly are not scared of humans and not afraid to take what they feel is rightfully theirs! These Critters Are Seriously Fearless! We got to work on dinner and in short order we were sitting down enjoying red snapper and sautéed veggies in a coconut milk sauce with fresh basil and cilantro, over some delicious (if over salted, my bad) red rice. With a black currant lambic to soothe our souls. I felt tired in a good way and with ease I drifted off to sleep with the lulling sounds of nature.